The search is on for Canadian businesses who are putting Canada and the world on a more sustainable path by advancing action towards the 17 UN Sustainable Development Goals (SDGs)! On September 28th, 2017, the Global Compact Network Canada recognized and highlighted the outstanding efforts of Canadian organizations who are adopting and implementing the SDGs at the 2nd annual SDG Awards. The aim of the Awards is to encourage all Canadian organizations to embed the 17 Global Goals and highlight some of the amazing progress that both the private and public sectors have made towards solving the pressing environmental, social and economic challenges of our time. On September 28th, 2017, the GCNC hosted its 2nd annual SDG Awards 2017 in Toronto! The Awards ceremony brought together senior leaders from the private, public, NGO and academic sectors of Canada, with the aim of recognizing SDG trail blazers and setting the stage for multi-stakeholder partnerships to advance the SDGs. The theme of our SDG Awards event this year was SDG 17: Partnerships for the Goals. For this year’s invite-only event, we welcomed Her Honour, the Honourable Elizabeth Dowdeswell, the Lieutenant Governor of Ontario, who provided the welcome remarks. Her Honour discussed two themes in her speech: Ontario in the world and sustainability. She stressed the need to increase the public’s awareness of the SDGs and the importance of getting rid of the notion that the SDGs are only for the developing world. We also had the honour of having Mrs. Celina Caesar-Chavannes, Parliamentary Secretary to the Minister of International Development and La Francophonie, who participated in an exclusive roundtable discussion session with our network of responsible businesses and organizations. Mrs. Celina Caesar-Chavannes explained the funding gap that means governments alone are unable to provide solutions for Canada’s key action areas and led a discussion on how we can accelerate progress on SDGs through Canadian partnerships. During the SDG Awards Ceremony, the Parliamentary Secretary recognized the organizations who received the most public votes for their SDG inspired initiative. Over 1000 votes were tallied. 6 out of the 20 organizations were recognized for their achievements in advancing the SDGs and provided short informative presentations showcasing their initiatives. The initiatives varied greatly with regards to the SDG(s) they targeted. The GCNC congratulates these winning organizations on receiving the most public votes for their SDG action-oriented initiative. Learn more about their submissions to the SDG Awards 2017. In addition to recognizing these Canadian organizations for their outstanding efforts, the Awards ceremony also aims to set the stage for an open dialogue between public, private, academic and non-government organizations. By engaging senior leaders from these sectors, the GCNC can achieve its mandate to facilitate SDG-advancing collaborations in Canada and abroad. In keeping with the theme, the event announced a unique, multi-stakeholder partnership to advance SDG #3: Good Health and Wellbeing. 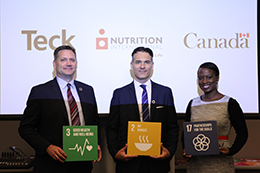 The partnership, referred to as ZACH 2.0, is a collaboration between three GCNC participants – Global Affairs Canada, Teck Resources, and Nutrition International. The initial Zinc Alliance for Child Health (ZACH) partnership was launched in 2011, and distributed more than 44 million zinc and oral rehydration salt treatments to children in need. Due to the success of the partnership, ZACH 2.0 is a renewed alliance to further increase access to zinc treatments to help save children’s lives in Senegal, Ethiopia, Kenya and Bangladesh. A panel discussion followed the announcement exploring how to leverage the strengths of various partners to advance progress on the SDGs. The panel was moderated by Joe Solly, Partner, Risk Advisory (Sustainability & Regulatory Compliance) at Deloitte Canada and the participating panelists were representatives of the organizations who formed the ZACH 2.0 partnership; Mrs. Celina Caesar-Chavannes, Parliamentary Secretary to the Minister of International Development and La Francophonie, Mark Edwards, Ph.D. Vice President of Community and Government Relations for Teck; and Joel Spicer, President and CEO of Nutrition International. To learn more about this the ZACH 2.0 partnership. To further explore the theme of strategic partnerships for greater impact, a second panel discussion was hosted on “The Fundamentals of a Fruitful Partnership” with experts from Frontera Energy, Global Affairs Canada, and Agrium. Aparna Venkatachalam, the Senior Manager of the GCNC, moderated a panel that included: Alejandro Jimenez, Corporate Affairs Director at Frontera Energy; Doug Beever, Senior Director, Sustainability & Stakeholder Relations at Agrium; and Sue Rauth, Deputy Director and Trade Commissioner at Global Affairs Canada. The panelists discussed cornerstones of a successful partnership including communication, patience, shared-value, integrity, measurement and respect. Furthermore, the conversation explored several topics including resources that organizations can utilize (e.g. Canadian Trade Commissioner Service) and SME involvement in the SDGs. The GCNC is proud to provide a platform for Canadian organizations to showcase their efforts to advance the SDGs. By enabling public voting, we are able to further promote greater awareness and knowledge of key sustainability issues, challenges and solutions. The GCNC congratulates the six organizations who received the most public votes and are advancing the SDGs related to: no poverty, zero hunger, good health and well-being, gender equality, climate action, decent work and economic growth, and more. Our goal is to inspire and encourage more like-minded organizations to apply next year and showcase further inspiring SDG action-oriented initiatives. Thank you for following the SDG Awards. Next year’s agenda will continue to push the frontier of sustainable development action in Canada, so stay tuned! For more information on the speakers and to access the event recording, please see below. The #SDGAwards2017 is set to be this year’s most important gathering of senior business leaders, government representatives and organizations, linking the SDGs to concrete partnerships and action-oriented goals! Please note that nomination and public voting have ended. Participate in the SDG Awards and highlight the business case for your company to help advance the SDGs! Please complete the following application form before July 24th; you do not need to be nominated to apply. Public voting will start on July 25th and closes on September 2nd – please see the important dates section for more information. Entries to the Awards will be uploaded onto the GCNC website for public viewing as they are submitted. This is an excellent opportunity to gain exposure and showcase your initiatives before public voting begins. When voting closes on September 2nd, 2017, the votes will be tallied and the winners will be recognized during the Awards ceremony. The winners for the Awards will be determined through a public voting process. The three entires receiving the most votes in each category (large organizations and small-to-medium organizations) will be the winners (6 winners overall). Voters will be required to select their top 3 choices for large organizations and top 3 choices for small-to-medium organizations. In total, they will be assigning 6 votes to 6 different companies. We want to raise awareness for and recognize the great initiatives and efforts that Canadian organizations are taking to help achieve the SDGs. Therefore, please help us spread the word and ensure that the best submissions win. Why participate in the SDG Awards? Be recognized as one of the leaders who are driving action towards the SDGs in Canada.